RGNUL PhD Admission 2019 - Applications are invited on prescribed form for admission to Eight (08) seats of PhD in Law and for one seat each of PhD in English/History/Economics/Political Science/ Sociology through an Entrance Test to be held on 05th May 2019 (Sunday) from 10.00 am to 01.00 pm at RGNUL Campus. 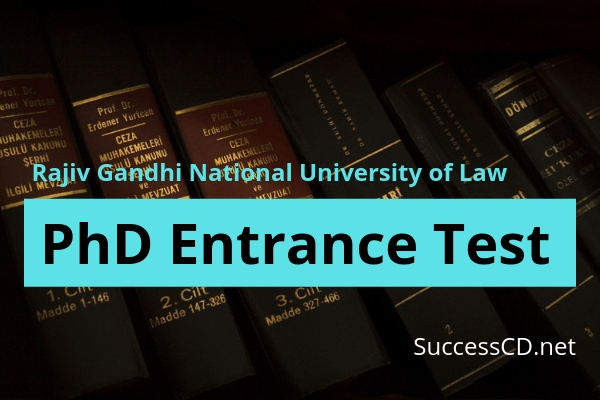 Complete details as provided below such as RGNUL PhD Entrance Test 2019, eligibility criteria, exam dates, application form and fees etc. A candidate can register for the PhD Degree Program either as a Full-Time Researcher or as a Part-Time Researcher. Minimum period shall be Three years and Maximum Six years for both categories i.e. part-time and whole time researchers. The duration of the PhD Programme and the time for submission of the thesis shall be counted from the date of Registration of the candidates. For regulations containing eligibility, syllabi of the entrance test, reservation of seats and other details, please visit RGNUL website www.rgnul.ac.in. Application must be accompanied by a demand draft of Rs.1000/- (Rs.700/- for SC/ST categories) in the name of the Registrar, RGNUL payable at Patiala (Punjab).